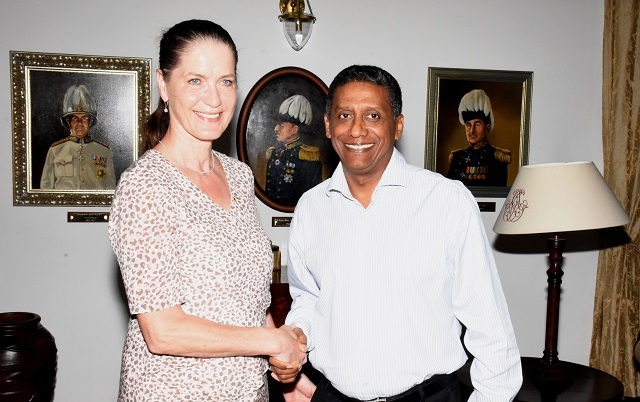 (Seychelles News Agency) - Socio-economic development, climate change, renewable energy and maritime security are key areas where the Seychelles and Germany can share expertise, the newly accredited German ambassador said Tuesday. Annett Günther presented her credentials to President Danny Faure at State House, Victoria. “We discussed a whole range of bilateral issues. Germany and Seychelles have a long tradition of good relations in various areas,” said Günther. The German ambassador and the president discussed the steps Seychelles has made in regards to socio-economic development. “The socio-economic development in Seychelles in the last years has been remarkable and I have commended the president for that. However, there are still a number of areas that we can think about to widen and deepen our relations,” said Günther. Seychelles, a group of 115 islands in the western Indian Ocean, is a popular holiday destination for Germans. Germany is the leading market in visitor arrivals in Seychelles and this year 45,228 Germans visited the island nation, according to the figures released by the National Bureau of Statistics on October 28. The Seychelles’ head of state and the German ambassador also talked about renewable energy, solar technologies and vocational training. “These are areas where we can still expand our cooperation,” said Günther. .
Seychelles has started implementing several renewable energy projects. The most recent one is the nation's largest photovoltaic farm on the remote island of Alphonse, making the island 100 percent diesel-fuel independent. This year marks the 41st anniversary since the establishment of diplomatic relations between Seychelles and Germany on 18 January 1977. The German ambassador will be based in Nairobi, Kenya.